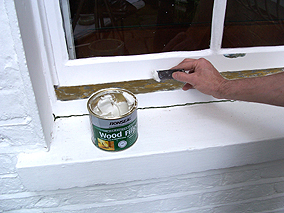 Painted wooden windows are often neglected. Eventually the weather gets to them and the paint starts to peel, bare wood becomes exposed to the elements, finally they may start to rot. If you have windows like this its worth taking the time and making an effort to restore them. If you don't they will eventually be to far gone to restore and you have to have them replaced. That's expensive. Old blistered paint that has flaked off down to bare wood needs to be removed before re-painting. 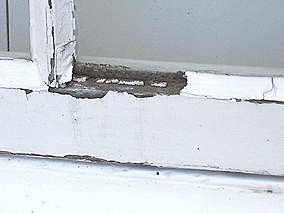 Its often the lower sections of the window that are worse, especially the bottom sill. Remove all the paint from really bad sections. The rest can be sanded thoroughly, undercoated then top coated. Badly flaking window in need of attention. The wood here will start to rot if left. You simply dab this on with a brush, leave it for a while whilst it dissolves the paint then scrape off it off with a paint scraper. This is a very effective method but can be a bit messy. Paint stripper is a very strong corrosive chemical. You must follow the instructions carefully and wear protective clothing, gloves, goggles etc. Nitromors supply a range of strippers for differing uses. The one pictured right is a very good general purpose stripper. You can buy an electric heat gun for around £20. Simply hold the gun near the painted wood till you see it blister then scrape it off. I use a triangular paint scraper for these fiddly areas. NB be careful they get very hot. And be careful when burning off windows that you don't heat the glass it will crack. Most heat guns will come supplied with several attachments to deflect the heat away from one side so you only heat the area you want. With the paint stripped off check the wood work for rot by poking it with a sharp object like a screwdriver. If its solid you can fill and paint it. 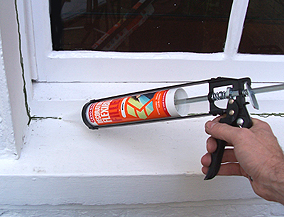 Fill any holes with a good quality exterior filler. I use an epoxy two part filler. You mix the filler with a hardener. It dries in minutes and so is ready to sand very quickly. It's very tough. The wood work on some windows may not be as bad but you'll usually find some cracking between the stone work and wood work. 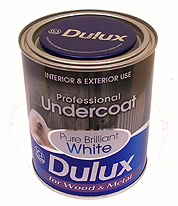 Fill this with flexible exterior decorators filler. Check that there are no gaps anywhere that water will get in. Decorators filler doesn't sand particularly well so smooth it into the cracks with a finger and wipe off the excess with a damp cloth ready for painting when dry. Bare wood will need several under coats. Bare wood should first be primed, then undercoated, then top coated. You can buy a combined primer and undercoat. I always use good quality paints as they give superior covering and filling properties as well as being hard wearing. Sand down between under coats until you get a well painted smooth surface. Use an oil based exterior gloss for the final top coat. Again it will tend to be the bottom sill that goes first. If you find small amounts of rot you can treat this. 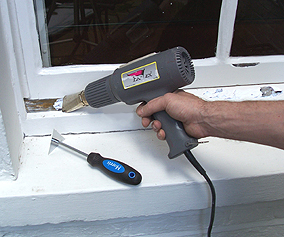 If its deep and extensive you may need to replace sections of timber or even the whole sill. This is quite a specialist job so I would advise you to get carpenter in or maybe a specialist window restorer. To treat small areas firstly dig out all the rot. It should come out quite easily. Treat the rotten are with wet rot hardener. This is a cellulose based product which you apply with a brush. It helps stabilise the rot. It dries very quickly. Apply several thick coats. Next fill the whole with a good quality two part wood filler. Sand and paint as above. If you have a painted stone work surround as part of you window with flaking paint you can remove this as above. Fill holes with a masonry filler then paint with masonry paint.